Most boardrooms look the same. Leather chairs surround an ornate wooden table and if you’re in a fancy boardroom there might be some tech on the table. And then, standing in the corner is a flip chart. A garish artifact of an age before digital screens that for some reason firms feel is a requirement. Look, we get it. In meetings you might need to write down a list of tasks or illustrate something but there has to be a better way, right? The Samsung Flip is a 55inch UHD display with touch functionality that replaces the old-school flip chart with something more secure and loaded with technology. The first thing you need to know about Flip is that it is simple. It’s not meant to be a smart display or a smart TV for that matter. It’s best described as a digital whiteboard or blackboard if you prefer. Simply put, it’s a board you can use to write things on during meetings. Where the Flip shines however is in how Samsung has added functionality to make the board more user friendly. Take the inclusion of a motion sensor for instance. The Flip will enter a low power state when the motion sensor isn’t triggered and will be ready to use once it detects movement. The Flip is also secured with Knox so it shouldn’t present a risk to corporate environments. Users can also secure drawings with passwords so that they aren’t visible when clients come in for meetings. That feature alone should be of value to business given the amount of times I’ve walked into a boardroom only to see a firm’s entire quarterly strategy visible on a paper flip chart. 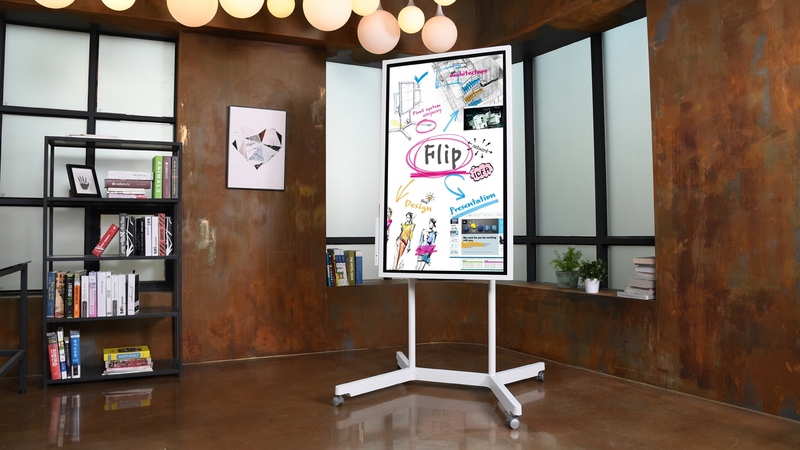 The Flip is equipped with WiFi and a LAN cable for connectivity so that users can email drawings made on the board to colleagues or transfer it to a network drive. There is also a USB port for presentations and another USB port allows the board to be connected to a PC so that users can control the PC via touch controls on the Flip. The stylus is an interesting piece of kit. Okay so it’s just a piece of wood but it’s tapered to two different sizes on either end so that it can be used as a pen or a highlighter. Your finger or palm can be used as an eraser. This is possible because the Flip is able to detect the size of the input on the display and adjust how that input is treated, on the fly. The Flip is available in South Africa and if you’d like more information about it we recommend giving the folks at Rectron a shout.